- Discover The Language of Life "
Discover The Language of Life"
A fascinating inquiry into the simple liquid that comprises most of our planet—and our bodies—but which is usually overlooked, taken for granted or, worst of all, despoiled. Though water comprises more than 70 percent of the human body and the surface of our planet, few of us give much thought to how we treat it, and how it is affected by a surprisingly broad range of environmental factors-- much as we are. "Secret of Water" invites us to consider the often extraordinary relationship between water and ourselves, and illustrates the surprising ways in which water responds to such intangible phenomena as thought and emotion. Drawing upon a broad range of interviews with scientists, thinkers and researchers, and traveling to exotic locations around the world, SECRET OF WATER expresses a point of view that is at once global and molecular.Among the many wondrous things its demonstrates is how positive words or harmonious music have a beneficial influence on water molecules while negative thoughts, emotions, harsh music, or even cell phones, have the opposite effect, transforming water molecules into smudged, distorted, formless shapes. Portraying water as a complex, living entity, it reveals a series of wondrous facts, ideas, and hypotheses, including the somewhat astonishing concept that water has the ability to “remember” anything with which it comes into contact. By showing us a new way of looking at the most common of all substances, SECRET OF WATER, by extension, shows us how to see the world, and ourselves, in uncommon ways. Using interviews with scientists, thinkers, and researchers, the filmmakers travel to beautiful locations around the world to tell the story of water's glory and the dangers posed to it by humanity's lack of respect for this precious gift. Scientists explain three of the wonders of water: its memory, its transfer of information to DNA, and its energetic qualities. Indigenous peoples have always honored the sacred and healing powers of water. They know that it can die if treated poorly. Water is very sensitive to sound, positive and negative thoughts, emotions, and the spiritual practice of intention. Secret of Water opens our eyes, hearts, and minds to this miraculous source of life and human flourishing. From the moment life first came into existence upon our planet, it was dependent upon the vitality of water. Over the years, our use and misuse of this precious resource has altered the vital information it carries in unexpected ways. As we consult with prominent scientists, including Konstatin Korotkov and Masaru Emoto, we gain insights into unlocking the secret of water so we can begin restoring vitality and vibrancy to all life on Earth. Water - a living substance, the most common and least understood. It defies the basic laws of physics, yet holds the keys to life. 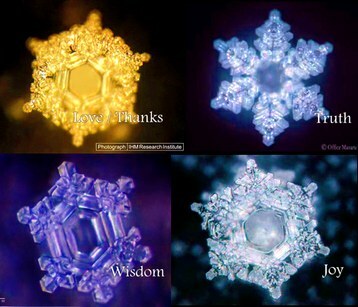 Known to ancients as a transmitter to and from the higher realms, water retains memory and conveys information to DNA. However, water can die if treated poorly. Water's arrangement of molecules can be influenced by such factors as sound, thoughts, intention, and prayer, as well as by such toxins as chlorine, affecting all that comes in contact with it. In this documentary, prominent scientists help reveal the secret of water, allowing us to use this amazing element to heal ourselves and our planet. The scientific research evidenced in this documentary gives further claims to the value and effect of water on our wellbeing & conversely our effect on the quality of our water supply. This film should be required viewing for ALL students. We take for granted the liquid life force found in water. The discussion of different states of water opens unto new ground; the ability of water to cleanse itself & regenerate leaves one in awe. One of the presenters, Dr. Larry Dossey, an internist, from Texas, is the respected author of many books. He has been active in the field of "energy medicine" and has a cameo appearance in this documentary. Schuaberger is mentioned too briefly. 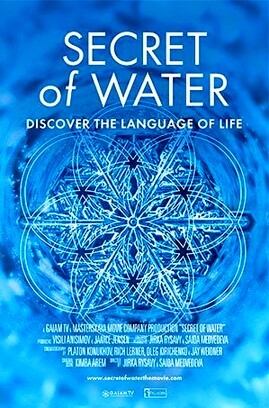 A meditative and luminous documentary about water, the source of all life and the bloodstream of the Earth.You will never look at water the same way again after watching this film.